For decades studios have been trying to adapt successful video game franchises into successful movie franchises, and more often than not, that transition fails to work. Much like book to screen adaptations, video games just have so much packed into them that it’s hard to cram it all into 120 minutes or less – and that’s not taking into account the extra connection that players have with these characters when actually experiencing the story while controlling them. So needless to say, the odds are stacked against these big budget blockbusters right out of the gate, and that’s why it’s even harder to see a movie like Tomb Raider get so much right yet stumble out of the gate and in turn jeopardizing a chance for potential sequels. I’d say that before even worrying about getting the story in place, the biggest hurdle for these adaptations is getting the right actors to play these characters fans have grown to love over the years. If you can win over the fans of the series with proper casting, then those who haven’t played the games but still want to see the movie should easily fall in line. Now, Angelina Jolie played the part of Lara Croft well enough in 2001, but the series has changed quite a bit over the years – with Lara now being a lot younger and taking the focus off Lara’s digital “assets” and bringing everything more into the realm of reality and survival – so the casting needed to reflect those changes as well. I’ll be frank here: even with the somewhat lackluster performance of Tomb Raider at the box-office, if the studio intends to continue trying to make this game into a movie franchise and chooses to go forward without Vikander because of what’s been considered a disappointing box-office, then they might as well just not bother because they’re not going to find a better Lara Croft than they have right now with her. Yes, Vikander absolutely nails the role of Lara, and is without question the best aspect about this movie. She brings Lara to life in a way that screams franchise – even if the box-office didn’t return that call. And that’s the unfortunate part of it, as Tomb Raider chose to somewhat mirror the story of the 2013 video game reboot, as well as Rise of the Tomb Raider, and in turn muddied up what should have been a stronger adventure film from a storytelling perspective. Let’s start with what the movie gets right, as I’d argue it’s successful at being a fun action flick…it just could have been a lot more than that. The story focuses on Lara being forced to come to terms that her father, Richard (Dominic West) is dead, having gone missing seven years prior while away on business. She receives a Japanese puzzle that was meant to be given to her upon her father’s passing. Quickly deciphering the puzzle leads Lara to a secret office at her father’s estate where she learns that her dad lived a much more eventful life than she’d been made aware of. It’s in this office that she finds clues as to where her father last went, and she then sets out on a mission of her own to find out what really happened to him. The setup to the story works well enough, and one thing they really get right in this movie is the game’s use of puzzles to move the story forward. They do this a few times throughout the film, and while it’s a nice homage, it does sometimes just come off as a plot-device, with the script casually throwing in Lara saying, “Things just stick in my brain,” early on to show she has a good memory; which does take away some of the potential suspense of audiences watching her unravel certain riddles and mysteries via clues, as instead she just kind of knows how to solve things when the time arises. But at the very least the proper attempt to include this aspect of the Tomb Raider world was there. What else works really well are the dynamic action sequences, which definitely give the feeling of playing the video game, while also coming off as just blockbuster movie moments for those who may never have played. The work that Vikander put in to put herself front and center in as many shots as possible reminds me of Tom Cruise, and how he’ll go the extra mile to make sure that they can get close-ups of him right in the thick of it, which helps get the audience engaged even more. That’s what Vikander has done here, and director Roar Uthaug also does a fantastic job of bringing the viewer right into the action alongside Croft with tight shots, and plenty of fast-paced, edge of your seat moments that definitely deliver the goods for action junkies. Now, a few of these moments are taken shot for shot right out of the video game, and while it’s likely meant as a wink and a nod for those Tomb Raider gamers out there, it also makes the argument that some of the core audience may have passed on seeing the movie because they’d already played a similar story out in the game. And that’s unfortunate, because this is a fun movie! But like many films these days, it also seems to be focused on setting up future movies instead of focusing purely on the story at hand. It’s fine to plant a seed or two, but with so much worry about setting up potential sequels, you lose time that should be used to strengthen the characters and investing audiences into this world; which, if done correctly, will make it a place they’ll want to visit again without having to rely on weak, predictable twists to set up a sequel that may never even come. This is most evident with the film’s villain, Mathias Vogel, played by the wonderful Walton Goggins. Goggins does solid work with what little he’s given, but instead of being a threatening villain with his own reasons for doing things, he’s simply written as a one-dimensional yes-man for the big bad secret organization that’s constantly eluded to set up that potential sequel. This argument could be made for Daniel Wu’s character, Lu Ren, whose only real function is to get Lara to the island with how much development he’s given. These are two characters, alongside Lara, that could’ve benefited from more focus and depth, which would’ve helped elevate the story as a whole. So when it comes right down to it, should you see Tomb Raider? Yes. It’s a fun adventure movie, and while it has flaws and isn’t as fleshed out as it should have been, it at least delivers with loads of action, which is what most audiences will want from it. 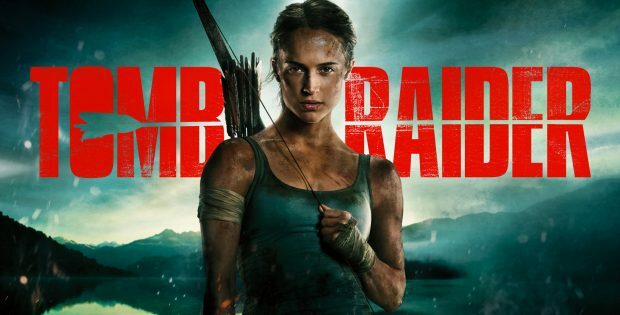 Vikander is superb as Croft and I really hope she gets another chance to showcase her tomb raiding skills, as if given the proper care moving forward, Tomb Raider truly has the potential to be a globe-trotting, action-packed blockbuster franchise – especially with her leading the charge. This film looks and sounds superb on Blu-ray! The video transfer is immaculate, really bringing the viewer into the action while sitting in the safety of your living room. The visuals are bright and vibrant when needed, and the darker scenes on the ocean, or in the tombs bring strong blacks without ever being muddy or washed out. The audio also delivers, with a great sound mix, as the film is loaded with sound effects, a solid score that all mixes nicely with the dialogue throughout. Lara Croft: Evolution of an Icon – This feature comes in at 10-minutes in length and is the longest of the four special features. It sees the cast and crew, as well as experts on the Tomb Raider franchise talking about the evolution of the character, and how far she’s come as a cultural and female icon after all these years. Croft Training – This was a great featurette that came in at roughly six minutes in length. This shows the workout routine, and diet of Vikander during the shoot. Watching the process is crazy, and it shows how much passion she put into the character. While short, it’s just more ammunition in the argument as to why Vikander is the ideal actor to play Lara Croft moving forward. Tomb Raider: Uncovered – This feature just sees the cast and crew talk about what brought them on board the film, some behind the scenes moments, and things along those lines. It’s just over five minutes in length, but is worth the quick watch for fans of the movie. Breaking Down the Rapids – This feature is roughly seven minutes in length, and it focuses on Vikander during the airplane action sequence in the film, where Lara falls into the rapids, grabs onto a rusted World War II plane, and then proceeds to fall from that to the water below. It’s a great behind-the-scenes piece that shows Vikander being filmed in a training area for rapids, where she’s got her hands tied and is tearing through actual rapids. We then go on to see her doing her own stunts on the wing of the plane, jumping to safety, and then falling as well. This is a great behind-the-scenes piece, and I actually wish they’d filmed more of them for the other big action sequences in the film. Warner Bros. Home Entertainment Presents Tomb Raider. Directed by: Roar Uthaug. Written by: Geneva Robertson-Dworet, Alastair Siddons. Starring: Alicia Vikander, Dominic West, Walton Goggins, Daniel Wu, Kristin Scott Thomas. Running time: 118 Minutes. Rating: PG. Released on Blu-ray: June 12, 2018.